For Privacy and Light Control, Blinds Can't Be Beat! Window blinds - horizontal and vertical - provide excellent light control and privacy. Blinds come in a whole range of colors and textures. Adjusting blinds to slant even a few degrees can give your room a whole new feel. Newer advanced mechanisms that can last many years. 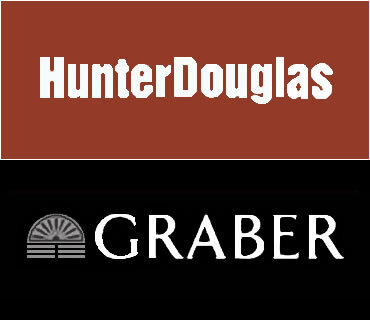 We represent top quality national brands such as Hunter-Douglas, Kirsch and more. In fact, there are so many blinds stylings AND WIDTHS OF SLATS that the choice can be overwhelming. Woods, metals, composites, and fabric inserts can add accents in a room that give even an experienced designer pause. But - not to worry. That's where our expertise comes in to guide you. Unwanted light can interrupt your sleep, fade your furniture and cause unsightly glare. You'll find that blinds - both horizontal and vertical - possess a level of light control so superior, only the beauty shines through. Either fully retracted to open your space to the environment, tilted to control the amount of light you want in the room, or closed to keep the coziness of your room private, you can count on that versatility with blinds. A window with blinds can be dressed up and softened with a wonderful valance, or surrounding fabric treatment. This marriage of hard treatments with soft fabrics combines privacy control, light control and beauty for your environment. So if control and appealing looks are what's needed in your space, blinds can certainly fit the bill. Ask us, your window designers, to guide you through the myriad of choices to determine the right blind applications for your home. We'll help you select the quality, color and styling of horizontal or vertical blinds to complement your good taste and lifestyle.